And welcome to my little personal crafting space! I try to fill my life with all sorts of lovely things that I find challenging, useful, colourful, comforting and practical. I hope that you’ll enjoy me sharing them with you. You can click on some of the smaller pictures in my site to see a close-up version (please let me know if you can’t and I’ll check the links). If anything’s unclear, please just ask by adding a comment to the page and I’ll try to help! 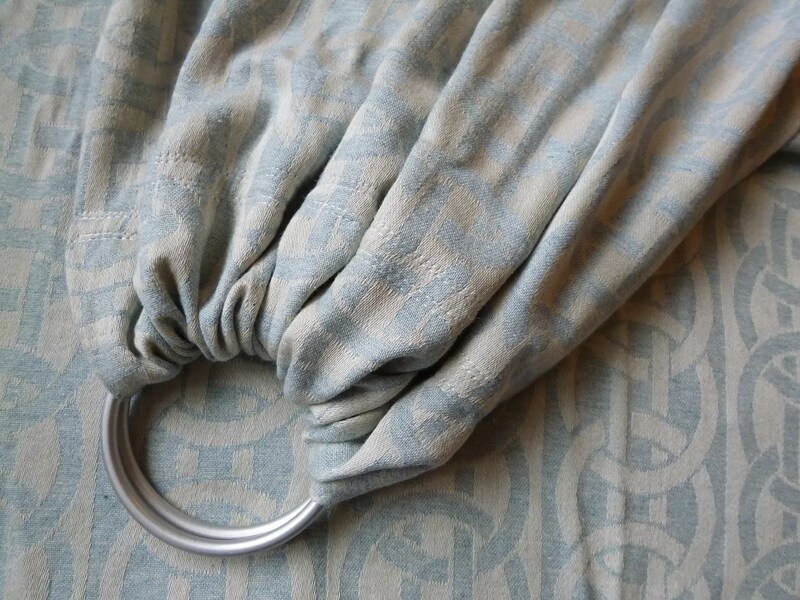 This unique piece of woven wrap fabric was just simply beautiful and wonderful to work with. 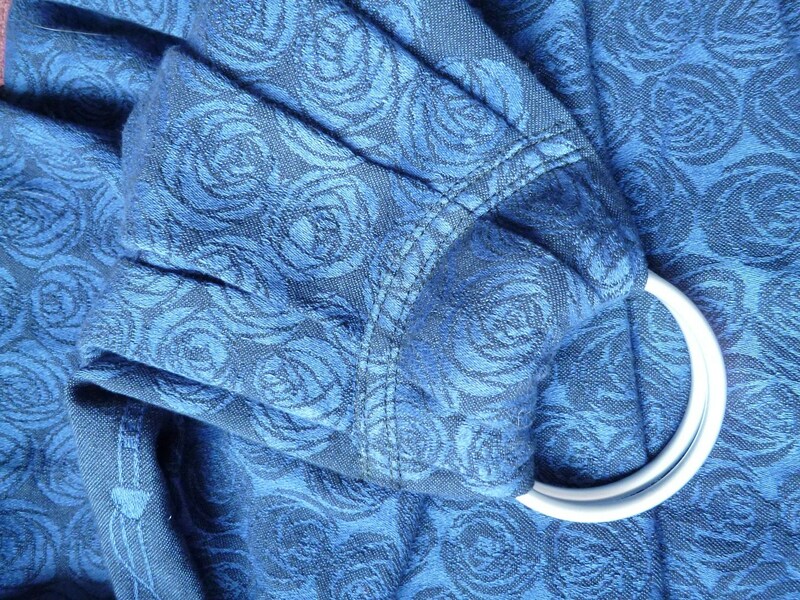 Originally an Oscha Zen Roses and dyed a gorgeous deep blue by Turquoise Fields, this lovely scrap is now a pleated ring sling with silver rings and off to be worn at a wedding! Neither does it justice so I can’t wait to see proper action photos of this one! 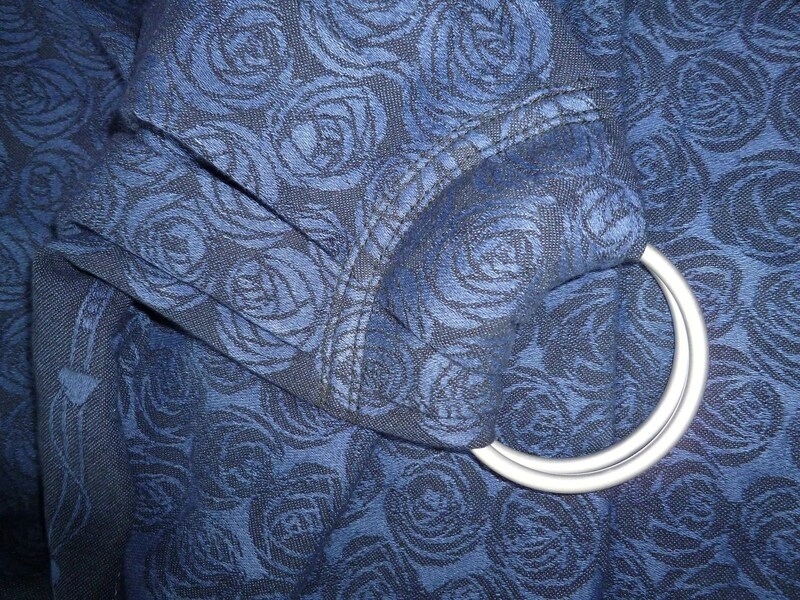 Beautiful Oscha Zen Roses made into a pleated ring sling with silver rings. 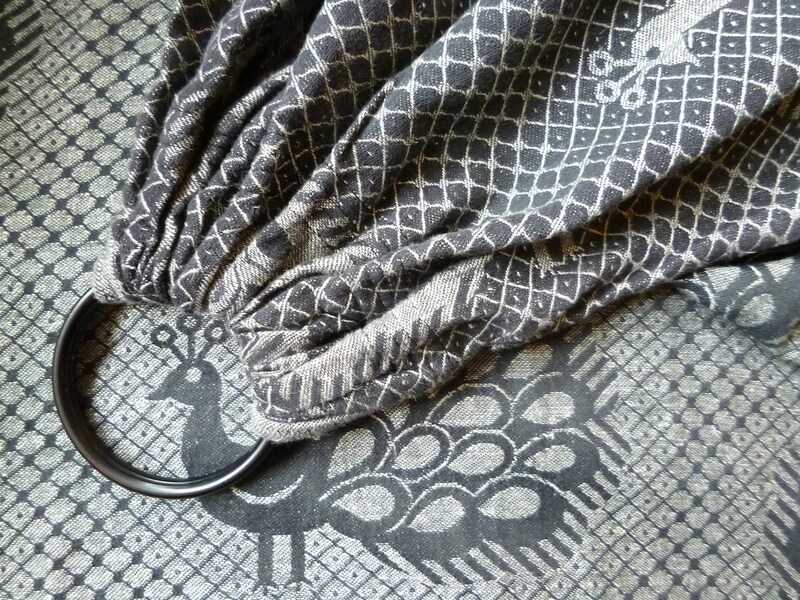 Such a gorgeous wrap to feel – I loved making this one! 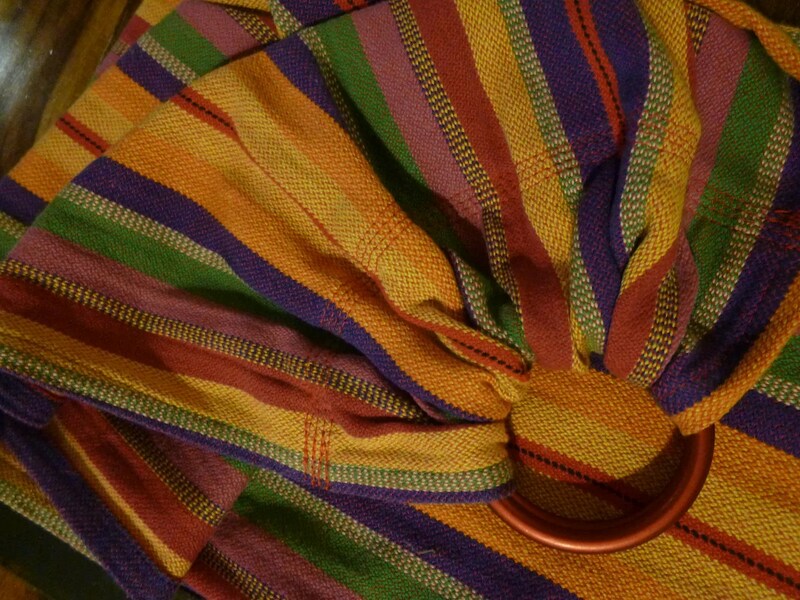 Today I made a start by sewing 6 lovely play slings for small people to use to carry their toys and dolls. I’ve made them in several lengths to see what suits which ages best, and used 3 different wraps, making 2 slings from each. 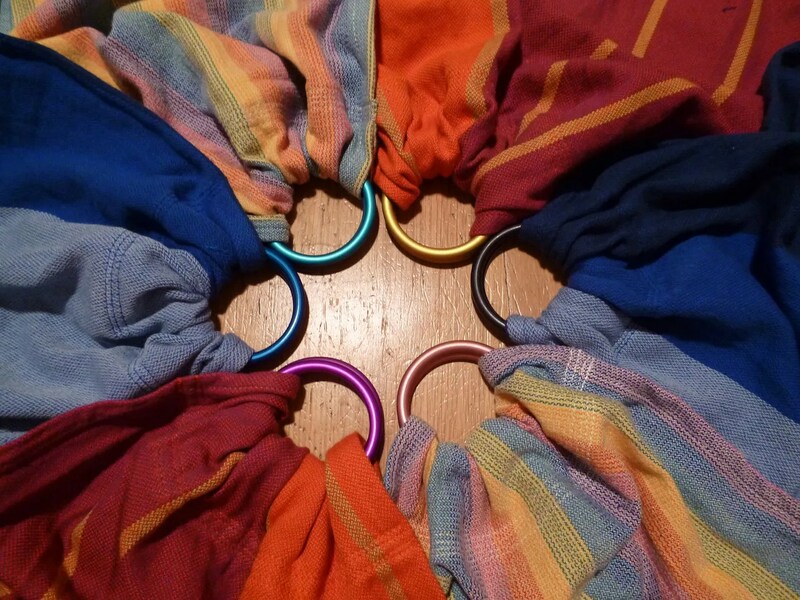 The wraps pictured here are: Lenny Lamb Sunrise (with aqua and pink rings), Natibaby Blue Danube (with blue and black rings) and a Neobulle Violette (with purple and gold rings). I’ll be adding many of these to the shop soon and I hope they all get lots of playing with! 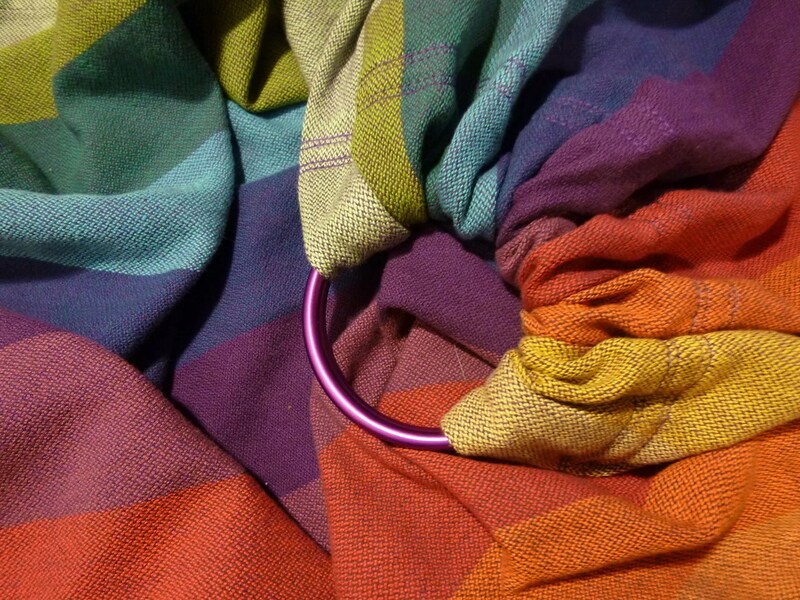 Another historical blog post to show a gathered ring sling that I made many months ago for the South London Sling Library. 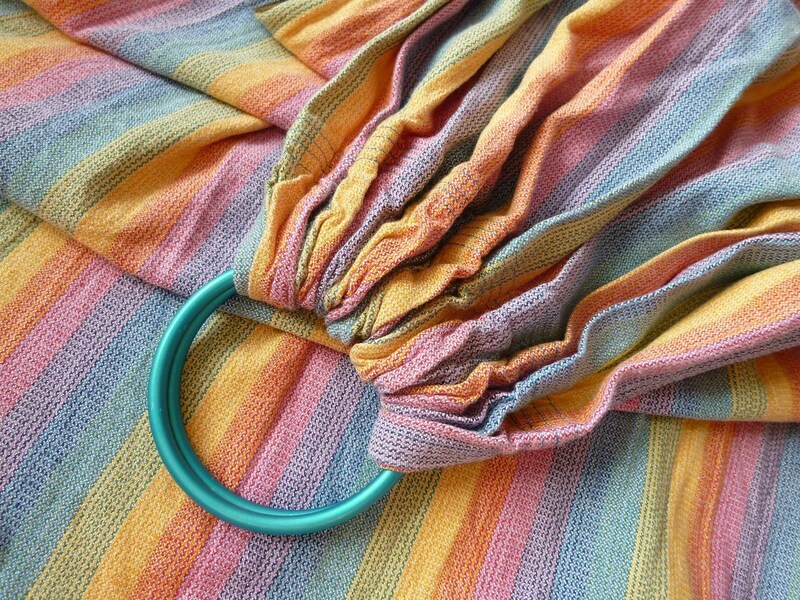 This is a Lenny Lamb bamboo blend Sunrise Rainbow woven wrap, converted into a gathered ring sling with large aqua rings. 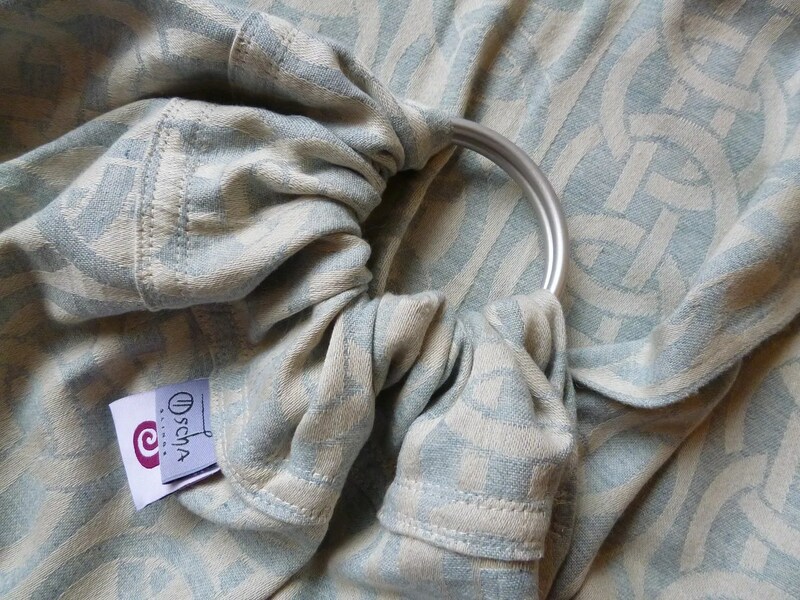 A simply gorgeous, beautiful and yet incredibly wearable wrap that’s light and supportive to use, even with a toddler 🙂 Re-made (again – I’ve resewn the shoulder of this sling once before) with a gathered shoulder and new Spaghetti Slings label! 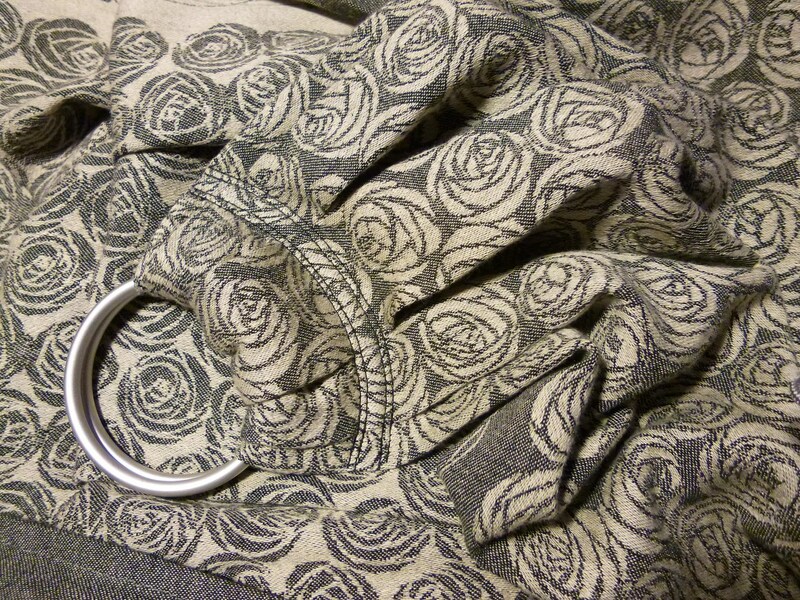 This is a bit of a historical blog post, but aiming for completeness so here’s a gathered ring sling I made from a Didymos Anthracite Hemp Pfau in March this year. It was a firm favourite over the spring and summer – supportive, goes with almost everything, Dad friendly and doesn’t show up any grubby marks! 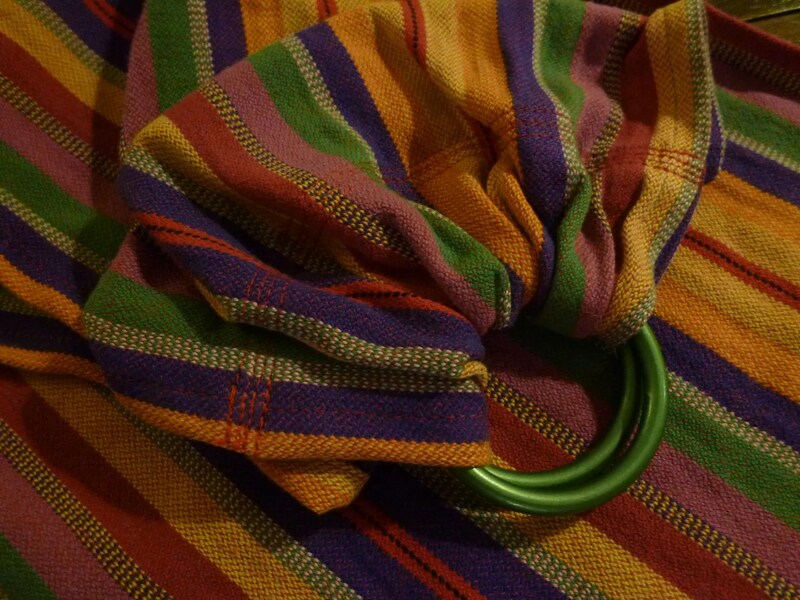 Last week I designed and sewed a beautiful Girasol Northern Lights rainbow wrap into a pleated ring sling. 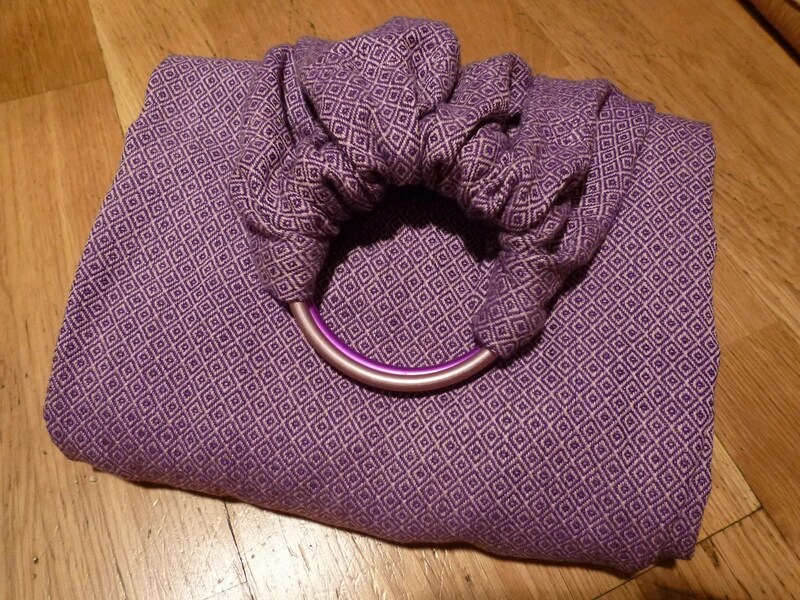 Tonight I sewed the other half of that wrap into a simple yet stunning gathered ring sling with purple sling rings. I think the wrap just speaks for itself – gorgeous!